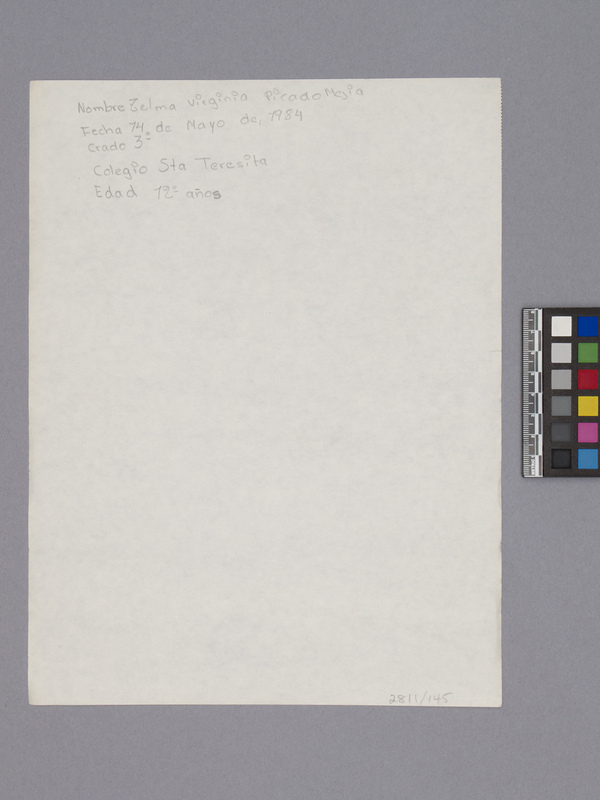 Item number 2811/145 from the MOA: University of British Columbia. Children's drawing on legal size off-white paper. An orange border has been drawn around the page. 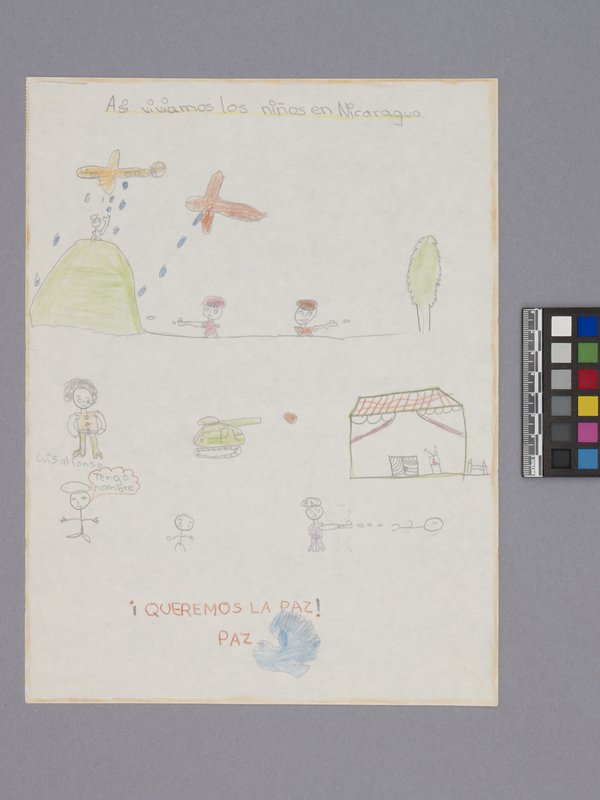 The top of the page contains an inscription: "Asi viviamos los niños en Nicaragua". The scene below this inscription involves two planes, one red and one orange, shooting down at a green hill. There is a small figure with a gun on this hill. To the right of the hill is flat ground with two soldier figures. The soldiers are firing guns and are wearing hats with "GN" on them. There is a single green tree on the right side of this scene. Below, a scene has been created that suggests the raiding of a house. The house is located on the far right, and a green tank and soldier dressed in purple are facing the house. The soldier is firing a gun at a human figure that is lying on the ground. The left half of this scene contains a small figure resembling a child, a figure with a pink dialogue bubble that reads "Tengo hombre", and a male figure with green pants, an orange top, and curly hair who has been given the label "Luis alfonso". The bottom of the composition contains the inscription "¡QUEREMOS LA PAZ!" The word "PAZ" has been written under this inscription, and a blue bird, perhaps a dove, has been drawn to the right of this word. There is some information written in Spanish on the reverse.